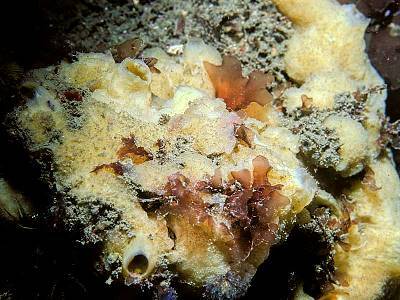 Description: This sponge can be very polymorphic, varying from a cushion to almost a branching-repent form. A cushion can give rise to oscular chimneys with oscules at the top or, more typically, to a profusion of simple, solid, tassel-like branches with the oscules mainly along their length (cf. 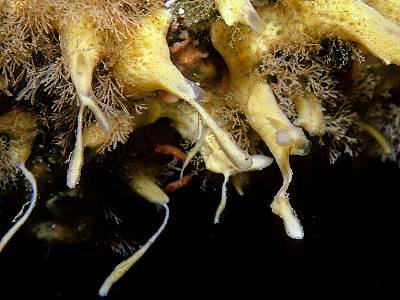 Halichondria panicea). In some sheltered localities the branches grow over other organisms and loop like bramble stolons, attaching to any suitable object they encounter. The colour is usually buff or cream, never green. 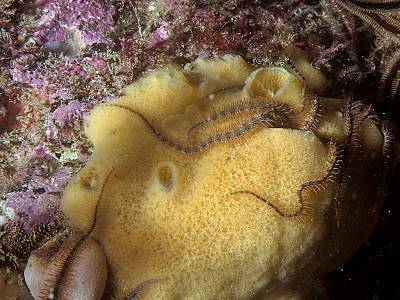 Habitat: On rock or other animals, even ascidian tests. It reaches its maximal development in harbours and estuaries, being very tolerant of muddy and brackish conditions where it tends to replace Halichondria panicea (but there are reports of both species occuring together in silty conditions). Distribution: A common species in the British Isles. Similar Species: The variable nature of Halichondria bowerbanki can make it very difficult to identify positively. 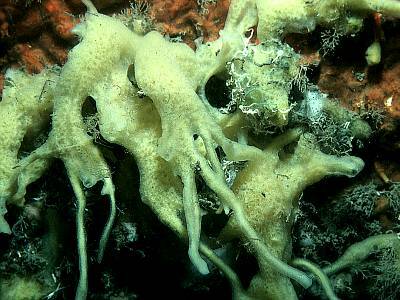 The most likely confusion is with Halichondria panicea. The growth of tassels in H. bowerbanki seems to be a good character, but these are not present all year round. H. bowerbanki lacks the green colour that is present in H. panicea in well lit conditions and also the characteristic smell. Picton, B.E. & Morrow, C.C. (2016). Halichondria bowerbanki Burton, 1930. [In] Encyclopedia of Marine Life of Britain and Ireland.